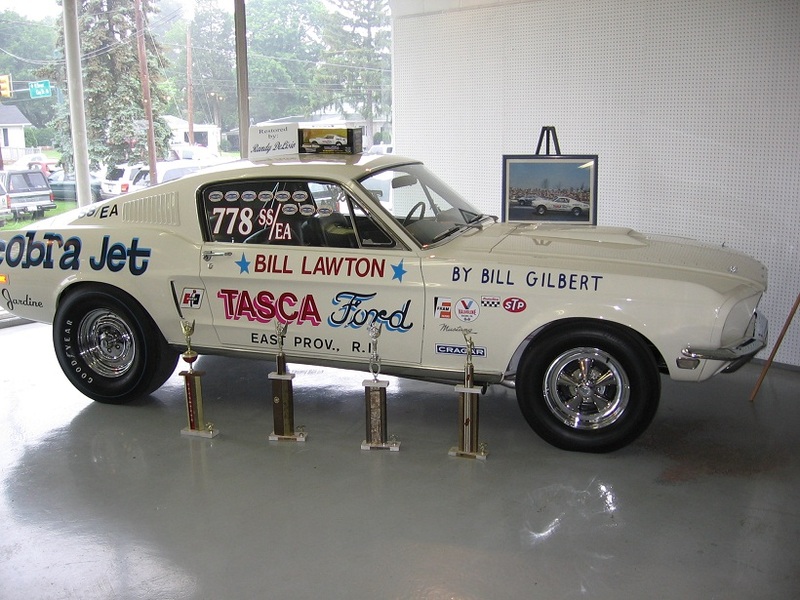 This car was assigned to Tasca Ford and according to Bill Gilbert of the dealership it was immediately sent to Holman-Moody for rework for the 68 Winternationals. They added ladder bars for better traction and dual electric fuel pumps for the SS/EA class. I have searched, but cannot determine if it was actually raced at the Winternationals. It may have served as a backup car. In later years, the car was well known to SS racing at Englishtown and Connecticut Dragway. The rear wheel area was mini-tubbed and a sidewinder intake system was used. The car was campaigned by Bill Lawton and had a best E.T. of 11.49 secs. I purchased it in 1986 and wanted it restored keeping the SS racing format. The car did not require extensive mods. The work was done by Randy Delisio. Car is pictured in the showroom at Carlisle in 2008.